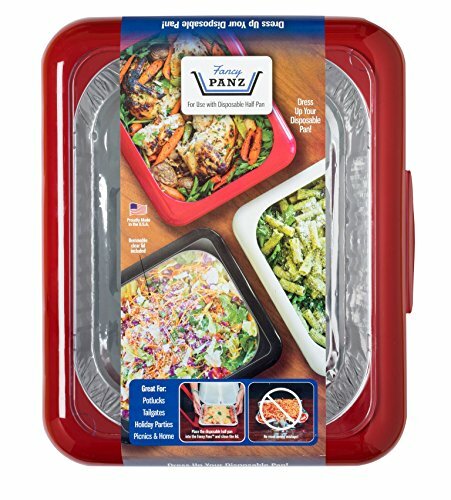 Proudly designed and manufactured in the USA, FANCY PANZ is an innovative solution to a common problem and is the perfect vehicle for dressing up and transporting your disposable foil pans. We all love the convenience of foil pans, but we do not like the instability, unsightly appearance, or the inability to stack them while transporting. FANCY PANZ solves all of these problems and more with the attractive design available in red, white, or charcoal. Simply open the frame and place your foil pan filled with your favorite dish into the FANCY PANZ, close the frame, snap on the clear lid, and you are ready to transport your casseroles, desserts, salads, chicken, anything hot or cold. Fancy Panz are designed to be used with a Typical Half Size Disposable Pan which are approximately 11 3/4 x 9 3/8 x 2 5/16. Manufacturers sizes can vary. Please cool hot foods to 200 degrees before placing in your FANCY PANZ. When it is time to serve, the clear lid fits discreetly under the pan. No longer do you have to worry about the potential accidents and messes that occur while transporting flimsy foil pans or the embarrassment of serving out of them. When it is time to leave, simply remove the foil pan and take your FANCY PANZ home, no more lost serveware! FANCY PANZ are BPA Free, and top-shelf dishwasher safe. The snap in clear lid fits discreetly under the FANCY PANZ eliminating the need to track it down when it is time to leave, no more lost serveware! So useful! Great product. Wish they came in other sizes. Five Stars This is a wonderful carry pan and such a great idea!